The maximum hair length a person can have depends on the lifetime of their hair. Healthy hair tends to last between two and six years. Waist-length hair takes about six years to grow out from a short hair cut, periodic trims included, so if your hair has a life cycle of two years you will never achieve a nice waist-length mane. Hair is as strong as iron wire. It will rip after applying a force equivalent to 60 kilograms. The average scalp has 100,000 strands of hair, or just less than 1,000 per square inch. People lose at least 40 to 100 strands of hair every day. Hair grows faster in the summer. A blonde head of hair tends to have more strands than red or dark head of hair. A single strand of hair has a thickness of between 0.02 millimetres and 0.04 millimetres, so between 25 and 50 hair strands next to each other are about one millimetre thick. By the age of 35, 40 per cent of men have noticeable hair loss. The number rises to 65 per cent by age 60 and 80 per cent by age 80. The trait for baldness can be passed down through maternal or paternal genes. If you do not cut hair it can grow to a length of 107 centimetres before falling out. 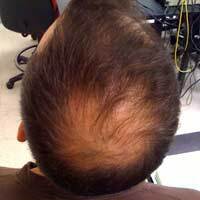 Crash dieting and hormone imbalance can trigger temporary hair loss. Over-brushing hair, wearing a hat and shampooing too much are all common hair loss myths. Hair grows at a rate of around 12 millimetres per month. There was a 12 per cent rise in the number of surgical hair restoration procedures worldwide between 2006 and 2008, from 225,779 to 252,002. Hair grows faster during sleep. Everyone is born with all their hair follicles, some of which are programmed to grow pigmented hair up to three feet in length. Hair loss affects around 50 per cent of women. A single strand of hair can live for up to seven years. There are 120,000 hairs on the average adult head, with blondes having the most (about 140,000) and redheads the least (about 90,000). Hair grows faster between the ages of 16 and 24. Peter the Great of Russia created a tax on beards in 1703 that almost caused a revolution. Healthy hair is very elastic and can stretch 20 or 30 per cent before snapping. The number of hair loss sufferers world-wide seeking professional treatment more than doubled between 2004 and 2008 from 361,077 to 811,363. A human hair is stronger than copper wire of the same thickness. Hair growth rate is very much related to the individual’s age and diet. Women tend to lose about 20 per cent of their hair between the ages of 40 and 50. Curling tongs were first made popular by ancient Romans. The combined strength of a head of human hair could support the weight of 99 people.